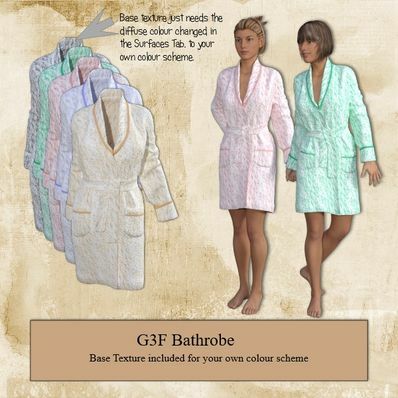 Bathrobe for Genesis 3 Female for use in Daz Studio 4.8. I have included several Textures. Use Base texture to change diffuse colour and piping in the Surfaces Tab, to suit your colour scheme. Thank you! I love your outfits. You do nice work! Thank you! Thanks! I needed this! I love your designs, Wilmap!! Thank you so much. Wonderful done! A marvellous and useful piece; thank you very much! I really love your work. WOW! Love the way the bathrobe drapes so naturally. The textures are great as well. You do such an awesome job! Thank you so much! Yes there is a bathrobe for G3M. This will be uploaded in a couple of weeks time. Excellent Thank you very much! Thanks Wendy. Very lovely garments. Really, really nice! Thank you.